Designing for print on screen is tricky and always requires clarity. There is very little sense of the scale of typography, and colours often look different. This results in multiple printouts to test the different font sizes and colours. Spector is a tool that helps bridge the gap of designing on digital screen for finalised print. 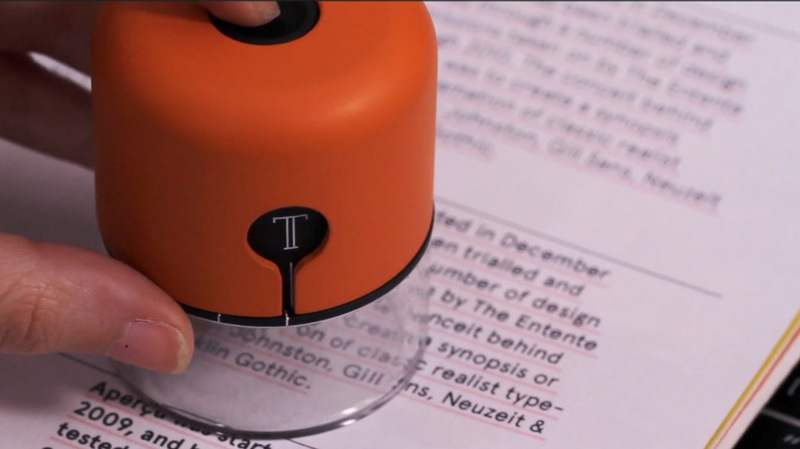 It is a hand-held device allowing various print materials to become interactive. If designing for print on screen, it is best to start with print. Spector software works as a Indesign plugin with a live feed of the camera. The hardware connects to the computer via bluetooth. The user presses the button on the device and takes a picture of the font with a macro camera and matches this picture to a font data base and changes live text in InDesign to that exact font, size, leading and kerning.